One-size is comfortable for folks from 4'10" to 6'6"
SkyRest Travel Pillow The Skyrest Travel Pillow is unlike any other pillow you have ever seen! We have all been there before. Sitting in an uncomfortable plane seat, wishing someone would invent a pillow that would make it comfortable to sleep on an airplane. 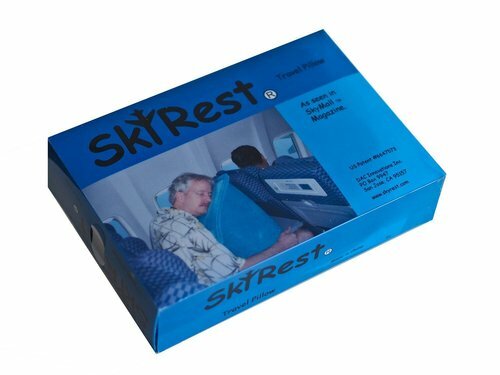 Well, look no further than the skyrest travel pillow! This inflatable pillow is easy to pack and carry on any airplane. The one-way valve allows for easy and quick inflation and deflation. The wonderful design of this pillow is the first of its kind to create a comfortable sleeping position on an airplane. This product works for individuals from 4' 10" to 6' 6". SkyRest is unlike any other travel pillow! Its patented design is one of the first to use the natural tendency of your head to tilt forward to help you sleep comfortably rather than just wake you up when your head falls forward! With SkyRest you want your head to tilt forward so you can lay down on it's soft top and get some rest. It is the first pillow to create a truly comfortable sleeping position while seated on an airplane. Because it's inflatable, SkyRest is easy to pack and carry on board and no need to worry about inflation or deflation either. 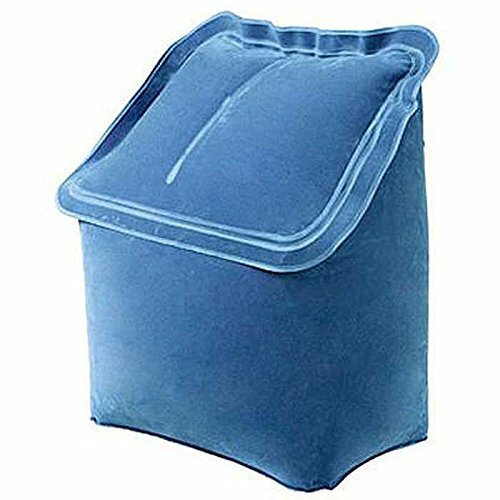 SkyRest' has a removable one-way valve that allows quick inflation and deflation. SkyRest' has proven itself to be an extremely versatile traveling companion. Unlike most travel pillows, that can only be used to support your neck IF you can recline AND your seat has a high enough back, SkyRest can be used in ANY seat as well as many other situations and positions to help ease your pain while traveling.